The Megabus is Coming: Texas Destinations for $1!! - Fueled by chile, frijoles & tortillas. 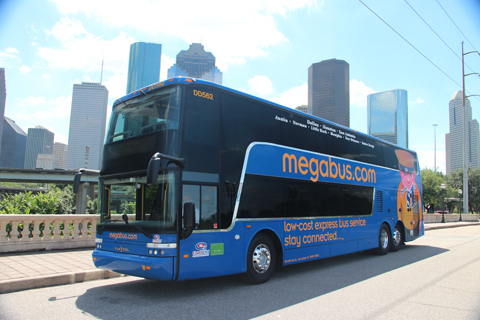 The Megabus is literally coming to Texas on June 19, 2012! Thank goodness for my much hipper and more news savvy friends!! Otherwise I probably would have never found out about this cool tidbit of information until one of these Megabus double-deckers would have driven up next to me on one of the freeways in town. No tienen idea how excited I am about these new buses coming to Texas on June 19, 2012!! The Megabus is coming y’all, LOL! For one thing, they’re offering fares as low as $1 to Houston, Austin, Dallas, San Antonio, and even New Orleans their first week of service in each of these cities. They’re buses also come with free Wi-Fi and power outlets! Are you kidding me?! Every time I fly Internet service at the airport alone is like $10. What really made me chuckle, though, is that these buses don’t actually have any real bus terminals at all. Instead, they’ll have established points within each city where passengers will hop on or off the “luxury” buses. My immediate reaction was: Oh, like the Mexican buses! I love that they are like the Mexican buses… only fancier! For more information about Megabus or to book your trip visit megabus.com. Greyhound (and Americanos) have been doing this for a while. THe $1 Busses are usually the first and last bus out for the day. I’m on a Greyhound from Austin now. The internet, however, is not something to brag about. It’s pretty slow, but the outlets and prices are great. Hey Jaime, thanks for the heads up! I figure it can’t be worse than the Greyhound. It took me about six hours to get there from Houston one time and that was without any internet or power. That was torture! It made the buses to Mexico seem so luxurious with their Cantinflas and India Maria movies, LMAO! Hey, what about El Paso? I love the megabuses. Such a great thing. They just need to begin servicing in El Paso Texas.